First we create a table by scanning the number from start to end. For each number we find number with largest sequence that is smaller than the current number. We set length of current items sequence length to be one more the found number. We also set the predecessor of the current item to be the found numbers index. From the table we see that the maximum length is 7 at index 10. So we start at index 10 which will be last item of the sub-sequence. The value is 16. Then we find its predecessor from the predecessor list at index 10 - which is 9. So the next to last item will be item at index 9 which is 12. Which has predecessor at index 7 and so on. A graph G is a set of of vertices V and a set of edges E that connects the vertices. 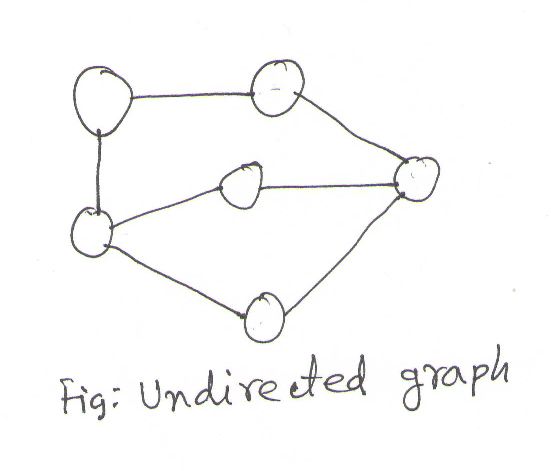 Graph can be either directed or undirected. 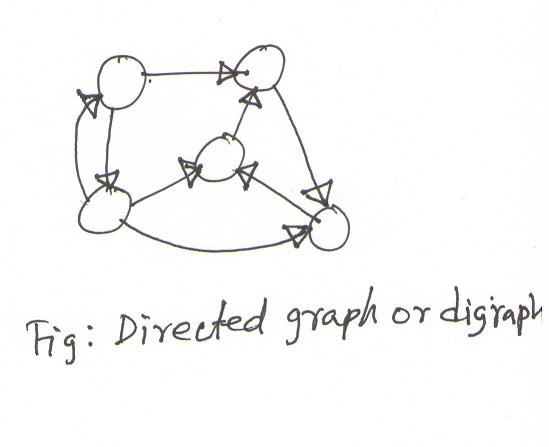 For directed graph or digraph edges has a direction. Multiple copies of and edge is not allowed in a graph. Digraphs may have two edges in opposite direction. A graph G(V,E), either directed or undirected, where each edge u in E has an associated weight with it. Weights can be either positive or negative. A sequence of vertices with where each two adjacent vertices are connected by an edge. For a directed graph each edges that connects the adjacend vertices must have a direction aligned to the path. The number of edges in the path is the length of the path. If a graph has edges such that is is a path from any vertex to any other vertex then the graph is strongly connected graph. Number of edges that connects a vertex to other verteices including itself (self edge) is the degree of theat vertex. Self edge is counted once. For digraph number of edges that are directed toward a vertex is the indegree of that vertex. For digraph number of edges that are directed away a vertex is the outdegree of that vertex. A graph that can be drawn on a plane without crossing edges. If a graph has fewer number of edges than maximum number of edges possible is called sparse graph. 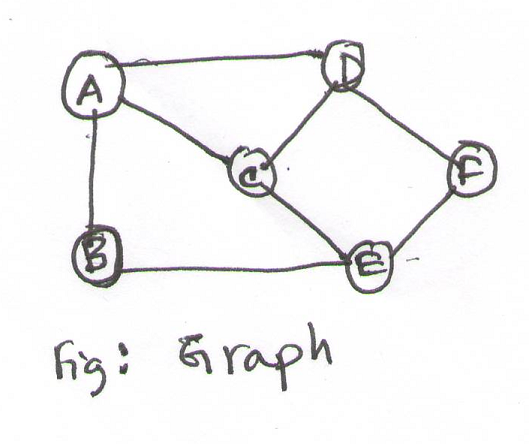 Graphs, either directed or undirected whether weighted or not, are generally represented in memory as one of two standard ways to represent a graph- using adjacency list or using adjacency matrix. If a graph is sparse adjacency list is used to save memory. For a dense graph adjacency matrix will save memory and will be fast access representation. To illustrate the two types of representation we'll use the following graphs. Uses array of lists, one list per vertex, where each list contains the items that is adjacent to the vertex that the list represents. To represent a graph G(V,E) a matrix of size VxV, requiring O(V^2) memory, is used. Each item a[i,j] in the matrix is 1 (or actual weight for the edge in case of weighted graph) if the edge (i,j) exists in E and NIL (or any convenient value like zero) otherwise. Adjacency matrix are simpler to use and faster compared to adjacency list. If a graph is small we may prefer to use adjacency matrix. The process of visiting each vertex of the graph once is called graph traversal. Visits deeper level nodes first before visiting any sibling of the current node. Uses stack or recursive method to keep track of adjacent nodes that are not visited yet. Visits all current level nodes first before visiting any deeper level nodes. Uses a queue to keep track of adjacent nodes. Finds the distances from source vertex or the root. A directed acyclic graph that defines the order of edges. In a graph G each directed edge (u,v) indicates that e mush come before v in the ordering in G. In G nodes may indicate ordered events. If G has a cycle topological sorting is not possible. 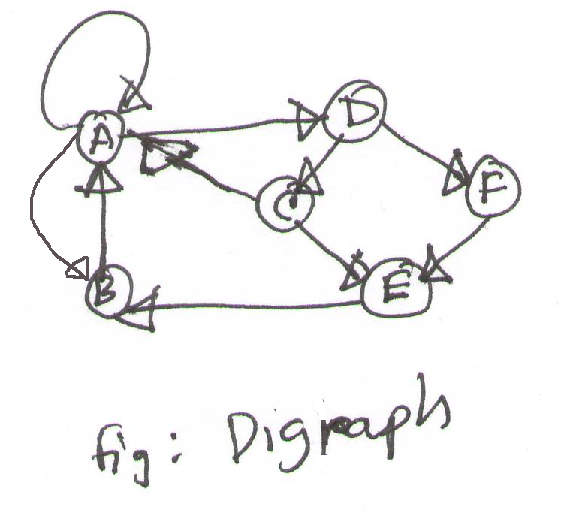 Kruskal's algorithm first creates a new graph G' with all the nodes of graph G. The hew graph initially has no edge. Then it takes edges in increasing order and adds two trees together to form a new bigger tree. An edge is only selected if the two nodes it is connecting is not already part of a tree. The process continues until there is no edge available to connect two trees. We can use a disjoint set determine if two nodes are in same set. Take all nodes and create disjoint sets those initially contains one node. Create a sorted list of all the edges by their weight in increasing order. Remove the smallest weighted edge E from the list. 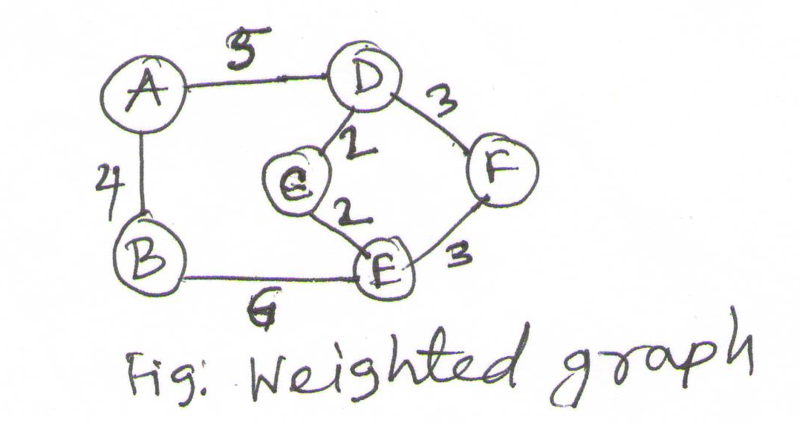 After the algorithm completes we have a set of edges in Selected Edges list that forms the minimum spanning three if the graph is connected or otherwise a minimum spanning forest. Splay tree is a balanced binary search tree. On average all operations take O(log n) time. Any sequence of k operations starting from an empty tree and never exceeding n items in tree will have O(k log n) worst case time. The data structure ensures fast access to recently accessed data and much easier to program that other balanced trees like 2-3-4 tree. Splay tree is not kept perfectly balanced all the time. We do splay operation whenever an item is accessed to move an item up through root. Repeatedly doing the operation moves the item up to the root of the tree. We continuously rotate the tree so that it takes the position of the item above (parent, grand parent, great grand parent etc.) until it becomes the root. 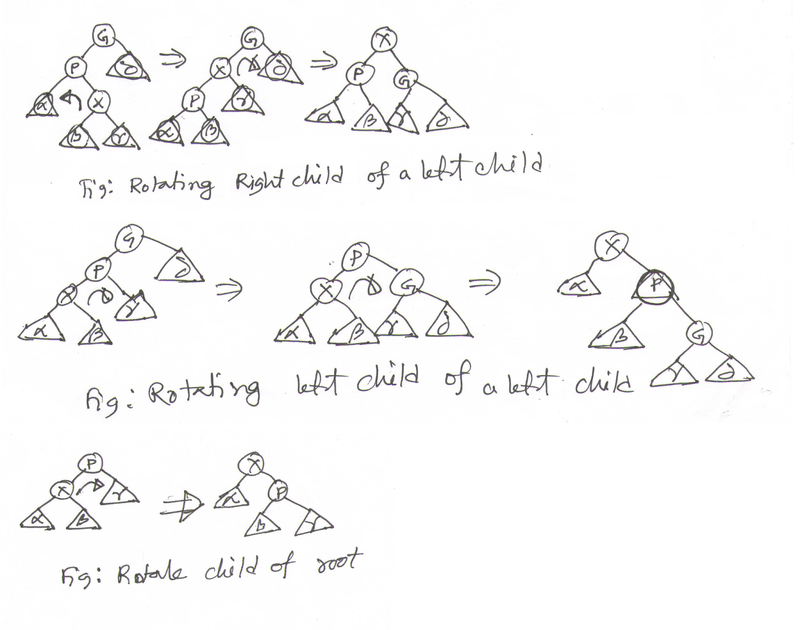 For left child of a right child we rotate right first and then rotate left to move the item two level up. For right child of a left child we rotate left first and then rotate right to move the item two level up. For left child of a left child we rotate right twice to move the item two level up. For right child of a right child we rotate left twice to move the item two level up. We rotate once as appropriate (left or right) to move the item to root. In all cases one rotation moves the item one level in upper direction. Splay X up to root using a sequence of rotation. A binary search tree is a binary tree such that for any node n, if a node x is in n's left subtree, x's key is smaller than n's key nad if x is on the right subtree of n, x's key is bigger than n's key. From above figure let us consider the node with key 15. Its left subtree has nodes with keys 10,5 and 12, all of which are less than 15. Its right subtree has keys 20,17, and 22 all of which are bigger than 15. Node with same key can be in any subtree. Binary search tree search for minimum or maximum key is fast and we can do inexact match like what is the largest key smaller than 57 and what is the smallest key bigger than 57. Or we can find a word with close but not exact spelling. While searching down the tree for a key k, if that key is not present we enclunter the node with smallest key greater that k and the node with largest key smaller than k.
If we do an inorder traversal we traverse the nodes in sorted order of the keys. Start with root node and go to left child until no longer possible and return the last node encountered. Start with root node and go to right child until no longer possible and return the last node encountered. Find the node n with key k.
If n has no child remove it. If n has one child replace n with its child. 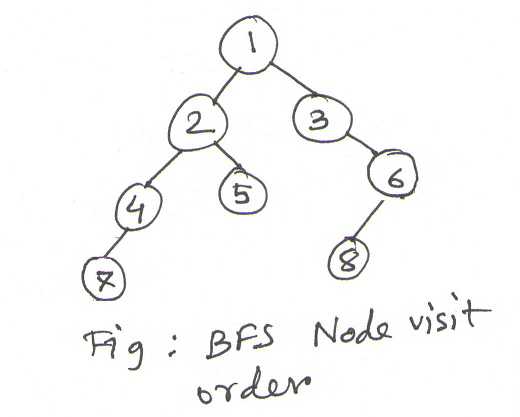 Running time for operations on a binary search tree depends on the depth of the tree. If the tree is balanced the depth of the tree oi O(log n) where n is the number of nodes in the tree. In that case the complexity of the operations is O(log n). But it is possible that the tree is not balanced. If we inser items in a binary search tree in sorted order the binary search tree becomes a linked list which will have a running time of O(n) for all operations. This is worst case running time. A tree is a collection of nodes and edges. Edges connects the edges together. In a tree there is one and only one path between any two nodes. Fig: A tree - here we have A,B,C,D,E,F nodes and l,m,n,o,p, edges. In a tree we define a path using connected sequence of edges. Number of edges on the path is called the length of the path. In above figure from B to F there is exactly one path and that is (m,n,p). In a tree we can pick a node and call it to be the root of the tree. We call this tree to be a rooted tree. We choose C to be the root and we redraw the tree to keeping the root on top and others in different level based on distance from the root. If we look carefully we see that nothing has changed for the tree but we have chosen C to be root and placed the nodes differently on paper. We draw the like figure 2 for convenience of understanding levels and relations. If we choose any node and find a path from that node to the root the first node we encounter is called the parent of that node. All node except the root has exactly one parent. Root has no parent. On the path fopm node F to root node C we encounter D first. So D is the parent of F and F is called to be child of D. A node may have any number of children including zero child. A node without any child is called a leaf node. A,F,E are leaf nodes. 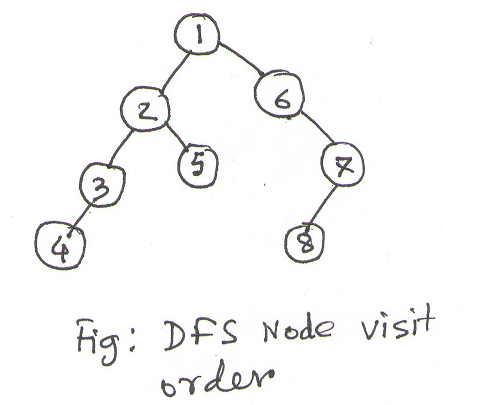 All the nodes on the path to root including F itself and the root is called to be ancestor of F. So F's ancestors are F,D and C and F is called to be their descendents. Length of the path from an node to the root is the depth of that node. Depth of F is 2. Length of path from a node to its deepest descendent is the height of the node. height of D is 1 nad height of root C is 2. Height of the root is also height of the tree. So the tree has a height of 2. Nodes having same parent is called to be siblings. B and D are siblings. Similarly E and F are siblings. A binary tree is a special type of three where no node is allowed to have more than two children. Fig: Binary tree - a node may hav zero, one or two children. We will discuss them in details. 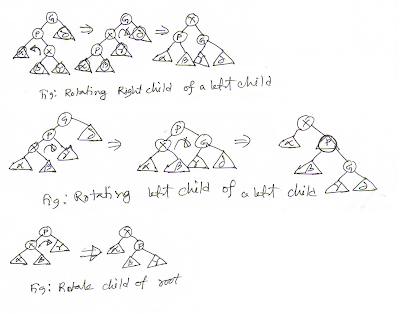 We visit each node starting from root and then recursively visit its children from left to right. We visit each node's children left to right and then visit the node itself. We visit left child then the node itself and then right chhild. We visit each level of the tree left to right before visiting any deeper level. We use a queue to keep track of the visited nodes children.